Neuroblastoma. Serum and urine catecholamine levels showed mild elevation of serum homovanillic acid (HVA) and urine vanillylmandelic acid (VMA). Histological study conﬁrmed the diagnosis of neuroblastoma. 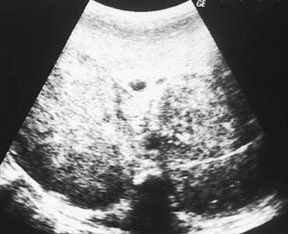 Sonography of the abdomen demonstrated a bilateral, mixed echogenic mass, enveloping the upper poles of the kidneys. These masses ﬂattened and displaced the kidneys inferiorly (Figure 1). Computed tomography (CT) showed bilateral large masses in the paravertebral region, compressing the upper poles of the kidneys, and crossing the midline, displacing vessels (Figure 2). No calciﬁcations were present in either mass and there was no retroperitoneal adenopathy or hepatic abnormality. The treatment of neuroblastoma depends on the age of the child and the stage of the tumor. Surgery is indicated for stage 1 and 2 tumors while chemotherapy and radiation are the primary treatment modalities for advanced tumors. The bilateral neuroblastoma is a rare entity. Medical imaging is very helpful in the diagnosis and the staging of this tumor. Kramer SA, Bradford WD, Anderson EE. Bilateral adrenal neuroblastoma. Cancer. 1980;45: 2208-2212. Cassady C, Winters WD. Bilateral cystic neuroblastoma: Imaging features and differential diagnoses. Pediatr Radiol. 1997;27:758-759. Kushner BH, Gilbert F, Helson L. Familial neuroblastoma: Case reports, literature review, and etiologic considerations. Cancer. 1986;57:1887-1893. Saks JB, Bryan PJ, Yulish BS, et al. Comparison of computed tomography and ultrasound in the evaluation of abdominal neuroblastoma. J Clin Ultrasound. 1985;13(9):641-645. Velaphi SC, Perlman JM. Neonatal adrenal hemorrhage: Clinical and abdominal sonographic ﬁndings. Clin Pediatr. 2001;40(10):545-548. Swischuk LE. Genitourinary tract and adrenal glands. In: Imaging of the Newborn, Infant, and Young Child. 4th ed. Philadelphia, PA: Lippincott Williams & Wilkins; 1997:663-667. Siegel MJ. Pediatric applications. In: Lee JKT, Sagel SS, Stanley RJ, Heiken JP, eds. 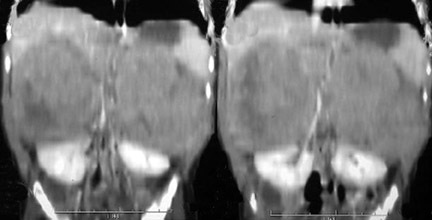 Computed Body Tomography with MRI Correlation. 3rd ed. Phila delphia, PA: Lippincott-Raven;1998:1523-1524. Bilateral adrenal neuroblastoma. Appl Radiol.